Pandora has a new tool in its belt to fight against Apple Music and Spotify. The music streaming just announced it will purchase Ticketfly, a Ticketmaster-type site, for $450m in cash and stock. Pandora says in a press release that Ticketfly’s service will allow Pandora listeners to better find live music events. It’s unclear at this point how deep the Ticketfly integration will go. Ticketfly currently works with 1,200 venues and event promoters in North America. The service primarily focuses on live music although briefly dabbled in sporting events as well. This is the latest in Pandora’s quest to stay at the top of the music streaming battle. Last month, at TechCrunch Disrupt SF 2015, Pandora co-founder and chief strategy officer Tim Westergren took the stage with our own Josh Constine to talk about Pandora’s unique model in the very competitive music space. It’s likely that Pandora will use this extensive data set to attempt to sell tickets through Ticketfly to events it knows listeners will enjoy. The acquisition is an exceedingly smart move to equip Pandora for the future, even if it seems expensive. Here’s why. Streaming radio itself isn’t very lucrative due to the relatively high royalty rates services like Pandora must pay rights holders. It’s an especially tough business if a service relies on ads to make money rather than paid subscriptions. People don’t typically enjoy having their music interrupted, which can make them sour towards advertisers. What is a booming music business is selling concert tickets. Prices have risen and fans keep on buying. With record “collections” going digital, there’s little pride in owning albums. Seeing a show live is a premier badge of honor for fans. And mobile devices and social networks make it easy to capture, remember, and show off that experience. The one type of audio ad that’s working well for Pandora lately is promotions selling concert tickets for artists a user was just listening to. Westergren told Constine at Disrupt that tickets it promotes in its ads often sell out instantly, and when it asks for more tickets or a band adds extra shows in a market, those sell out too. Pandora recently sold a whopping 55,000 tickets for the Rolling Stones in 24 hours, and sold 25,000 tickets for indie artist Odesza. So it makes perfect sense for Pandora to just own the entire ticket business from advertisement to sale. Pandora will get to keep the lucrative convenience fees on the tickets while Ticketfly can avoid paying for promotion by using Pandora’s ad inventory. 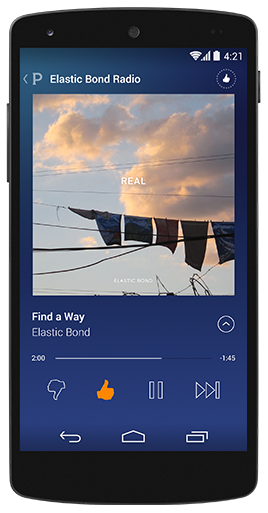 You could imagine Pandora baking the ticket sale interface right into its app, which is used by many of its 80 million monthly listeners. That’s a lot of distribution that could help Ticketfly compete with its age-old rival Ticketmaster. Plus, between Pandora’s listening information and its previous acquisition of music insights startup Next Big Sound, Ticketfly will get access to gobs of data on where each artist’s listeners are. That could let Ticketfly forge better relationships with artists by helping them sell more tickets through knowledge of where to book shows of what size. It’s such a good idea, it begs the question, might Spotify buy a ticketing service? It has been getting cosy with Songkick. And Songkick’s founder Ian Hogarth gets how streaming and ticketing will collide. To understand it for yourself, read his recent TechCrunch guest post on how 1 trillion streams a year could spur $10 billion in ticket sales.